North Carolina A&T answered the bell against Bethune-Cookman as it came up with a come-from-behind win to stay perfect. North Carolina A&T coach Rod Broadway, with his team’s 24-20 win over Bethune-Cookman secure in his back pocket, leaned forward in his seat and spoke candidly about why his team continues to get its opponents best efforts. Broadway and his team had reason to feel good about their hot start, as the win moved them to 4-0 in the MEAC, keeping pace with Hampton as it beat Florida A&M earlier in the day. 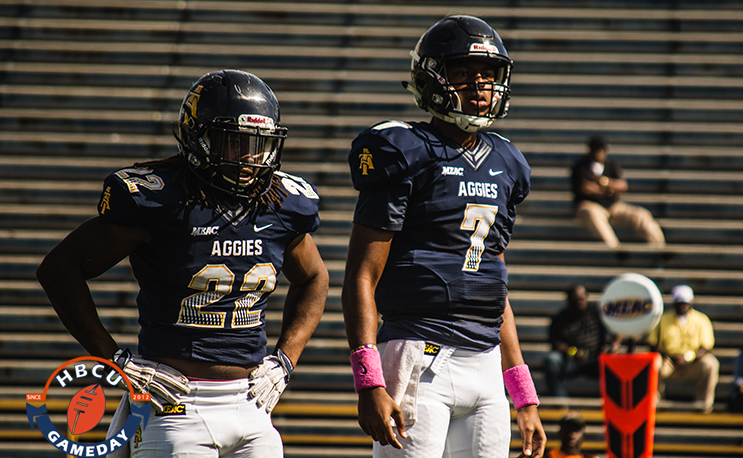 A&T used three touchdown passes from quarterback Lamar Raynard and solid running by Marquell Cartwright to improve to 8-0 despite a solid effort from Bethune-Cookman. BCU led 20-14 in the fourth quarter before Raynard found Trey Scott for a four-yard scoring strike which put A&T up for good. The first of Raynard’s scoring tosses came on a short pass that Jaquil Capel took 62 yards down the right sideline to give A&T a 7-3 lead. BCU would briefly take a 13-7 lead in the second quarter when Larry Brihm hit Frank Brown for a 30-yard score with 8:37 to go in the second. Raynard, who was added to the Payton Award Watch List earlier this week, finished 11-for-25 with 177 yards to go along with his three scores and no interceptions. He also got the chance to catch a pass in the fourth quarter, and nearly scored. He also became just the fifth quarterback in Aggie history to cross the 2,000 yard passing mark in a single-season. Not that it mattered too much to him. So far, so good in Greensboro. Another opportunity to impress NFL scouts lies ahead. Arkansas-Pine Bluff brings home one of its own to help rebuild its football program. Schools this year get to sign players earlier than ever.